- Made of cotton canvas and metal zips, leather hand strap, simple and fashion. - Smooth fabric lining, unique and fashionable design. - Function: Tote Bag, Shoulder Bag and Top Handle Handbag. - Whether you are outdoor travel, work, shopping, going to school. This bag will be your best choice. 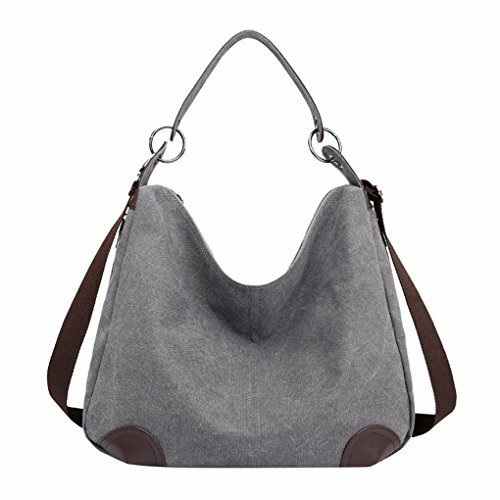 What you can put in this Canvas Hobo Bag ? - You can put: 2-3books, iPad, glasses, wallet, keys, cell phone, document or cosmetics in the bag. We highly appreciates all customers' opinions to improve the service. If you have any doubts, please contact us immediately! Material: cotton canvas, smooth polyester cloth material lining, it's comfortable and durable. Structure: 1 main pocket, 1 inner zipper pocket, 1 back pocket, 2 side pockets, one removable and adjustable shoulder strap. This bag has awesome secure zippers that could keep all your essentials(wallet, wipes, change of clothes, snacks, smartphone, etc) in the bag safely. Dimensions: 16.5" L x 9"H x 5.9"W inch, Handle strap: 7.8 inch. Shoulder strap length(min to max): 24 to 47 inch. If you have any questions about this product by Lonson, contact us by completing and submitting the form below. If you are looking for a specif part number, please include it with your message.